Terry Huffington admires her orange crop. During the snowy winter months in Steamboat Springs, days of fresh fruits and vegetables from the farmer’s market are a distant memory. Resigned to what the grocery stores can supply during colder months, locals trade in gardening tools for skis and snowshoes and patiently wait for summer’s bounty. This is true unless you live at Elkstone Farm. At this Garden of Eden-type oasis nestled in the aspens in Strawberry Park, workers pick ripe citrus fruit off the branches during the heart of winter. Steamboat resident Terry Huffington and her crew are harvesting uncommon winter produce usually trucked in from thousands of miles away – local produce that’s practically unheard of in this climate. Despite deep snow and below-zero temperatures, lemons, limes, passion fruit, blood oranges and figs flourish inside her greenhouse. Here, they soak in the Colorado sun unthreatened by 2013’s coldest January on record, thriving at 6,700 feet in elevation. Taking locavore to a whole new level, Huffington and her husband, Ralph Dittman, are utilizing permaculture to create an astonishing garden at their doorstep that most mountain folks could only dream of visiting in lush faraway lands. With its beginnings in Australia in the 1970s, permaculture is a design system for creating sustainable human environments and ecological landscapes that produce food. According to permaculture experts, emphasis is placed on multi-use plants, cultural practices such as sheet mulching and trellising, and the integration of animals to recycle nutrients and graze weeds. Permaculturists strive to mimic patterns found in nature by creating harmonious relationships between houses, plants, animals, soils and water. Huffington was trained in permaculture in Basalt. She has since visited other permaculture gardens, learning how to produce and harvest crops year-round, even in a challenging climate. “Permaculture is healthier for the land and for ourselves. It’s the kind of thing I wish I’d discovered when I was 30,” says Huffington, a geologist who is now retired from the oil and gas industry. Huffington’s vision has been tweaked and modified, and the self-funded 8-acre farm is now mostly producing a thriving assortment of Mediterranean and other plants including lavender, rosemary, thyme, mint, parsley and edible flowers like nasturtiums, calendula and pansies. 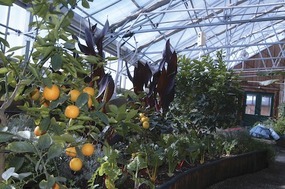 The first greenhouse was built in 2009, a 2,880 sq-foot Mecca of passion fruits, lemons, limes, oranges, figs, herbs and an unstoppable banana tree that thrive with no supplemental heat other than the sun, with additional back-up from two small electric heaters and a wood stove that uses pellets from pine bark beetle killed wood. Walking through the vast, humid greenhouse is a colorful, Willy Wonka-type experience, with new surprises and delectables around every turn. The oxygen-rich atmosphere is both energizing and tranquil, momentarily taking your mind from the 3-foot-high snow banks outside to a tropical paradise. Water for the greenhouse comes from a well, which feeds plants on an intricate drip system. To the north of the greenhouse is a prosperous fruit forest containing 20 varieties of apples and pear trees, currants and gooseberries, all planted in guilds with beneficial shrubs and a cover crop of clover that attracts pollinators and adds nitrogen to the soil. A central pond garden is home to apple trees, crabapple trees, cherry trees, blueberries, raspberries and strawberries. To keep out local wildlife, the property is surrounded by an 8-foot fence, still no match for the occasional bear. Just steps from the greenhouse, the family’s main house includes a commercial kitchen, refrigerators, offices and an upstairs caretaker unit with views of the entire property and surrounding valley. Last year, Elkstone Farm added its first hoop house, a 32 x 70-foot greenhouse of double layered plastic – a virtual salad factory – growing kale, spinach, chard, Asian greens, arugula, veggies and annuals. Late summer production from this house alone also included multiple harvests of basil, cucumbers and tomatoes. Also, a large custom-built seed house is nearing completion to propagate seedlings and prepare and package produce, with an upstairs area dedicated to drying and packaging herbs. Elkstone Farm has one part-time and three full-time employees and has been selling some of its produce, including salad greens, squash blossoms and herbs, to local restaurants and Bamboo Market in downtown Steamboat. Huffington plans to increase production along with a line of homemade jams, jellies, breads, pickles, salsas, rubs, unique pestos and herbed salt blends. Verploeg has been with Elkstone Farm for over a year and has the unique job of surveying what is growing and finding recipes that showcase each product. Results have included fig jam, lavender jam, lemon marmalade, nasturtium pesto and tomato preserves. Nutritional chef Alex Berger takes those ideas and his own to produce garden fresh products that are as unique as the farm itself. It's true, Strawberry Park citrus trees bear fruit in January. Fresh greens flourish year-round in Elkstone Farm's greenhouse. Behind the gates of Elkstone Farm, thoughtful design, dedication to health and the environment and working relationships are creating a productive garden sanctuary. A private person by nature, Huffington sees future tours as a possibility, but is taking the growing process slowly, nurturing what she has created and moving one step at a time. The glass: Two-layer polycarbonate glass comprises 60% of the structure and allows 75% sunlight through it. A curtain inside the glass can be closed to further reduce the amount of heat loss during cold nights. The glass opens for ventilation, cooling and pollinator attraction, with flowers situated near the openings in the summer to attract important pollinators such as bees. The climate battery: Instead of electricity, the greenhouse utilizes thermal energy with an underground solar heat storage system called a “climate battery” that is built into the 4’-deep rich-soil floor. Raised plant beds are on top of that soil. 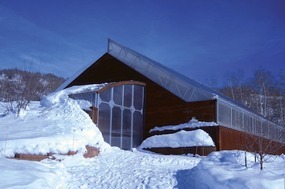 Via a ventilation system, the “climate battery” stores excess heat produced in the greenhouse underground. Inside the soil floor, a network of air tubes transfer heat and moisture between the air inside the greenhouse and the soil. Even in January it can get hot inside the greenhouse, so fans move air and store it down in the soil where it cools off and loses some of its humidity. A greenhouse at Elkstone Farm.